This older model wooden police baton was used as a non-lethal alternative when making arrests. This baton was owned by Robert Joseph Chewning (b. 1923), who had served as Chief of Police for the Orlando Police Department (OPD) from 1967 to 1973. Chief Chewning was born October 22, 1923, in Baltimore, Maryland. After serving in the Eighth Air Force (8 AF) of the U.S. Army Air Force during World War II, he migrated to Central Florida and began his law enforcement career with OPD in 1946. While Chief Chewning was in office he made great strides in modernizing the agency. He instituted several progressive programs, including issuing portable radios to patrol officers. One of his successful plans was to give financial aid to officers under his charge to pursue higher education and obtain their college degrees. Chief Chewning later served as the Director of Public Safety for Orange County. 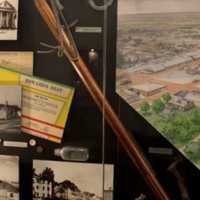 Original nightstick: Orlando Remembered Exhibit, Orlando City Hall, Orlando, Florida. "Proper Use of the Police Baton or Nightstick. YouTube. Flash video file. . https://youtu.be/jfvWAz_qMcI (accessed January 30, 2016). Orlando Police Historical Report. Orlando, Fl: Orlando Police Dept, 1990. "A Tribute To Robert Joseph Chewning." Lake Mary, Fl: 2006. Accessed January 30, 2016, http://orlandopoliceretirees.com/Robert%2520Chewning%2520Tribute.pdf. “Orlando Police Department Night Stick.” RICHES of Central Florida accessed April 21, 2019, https://richesmi.cah.ucf.edu/omeka/items/show/7855.